The optical table is an invaluable tool for the realization of any optical experience. In practice it is a platform used to support systems for optical experiments. 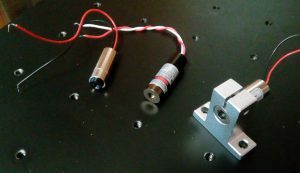 In optical systems, the alignment of each component must be extremely accurate, think for example of an interferometer. 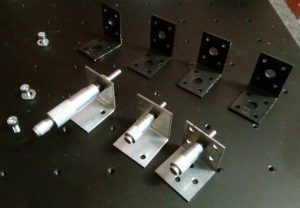 Even small vibrations or deformations of the platform on which the various elements are placed can cause the failure of an experiment. It therefore requires a rigid table that does not move or bend, and has the ability to dampen vibrations. 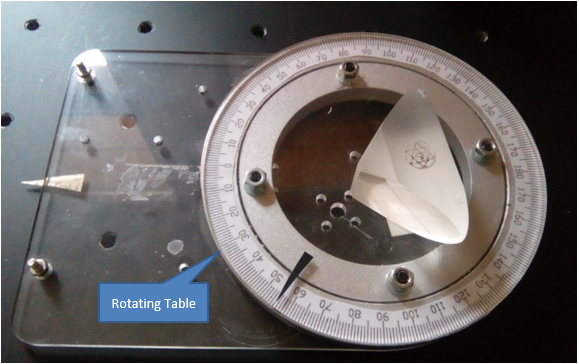 The table surface must be flat to allow optimal contact with the supports of the various elements and to facilitate the assembly of the optical system. Of course there are so many commercial solutions, but they are all, invariably, rather expensive. However, the optical table can also be made at home (or rather in the workshop) with little effort. We started with a 50cmx50cm iron plate, the iron is quite cheap and is heavy enough to get a fairly stable platform. Aluminum is just as good, but it is certainly more expensive, and iron can also be used with magnetic supports. 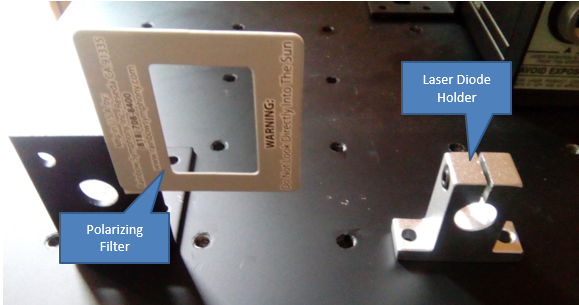 The plate must then be drilled so as to create the fixing points for the optical supports: we have made a matrix of holes with nine rows for nine columns for a total of 81 holes, threaded M8 (alternatively you can make M6). 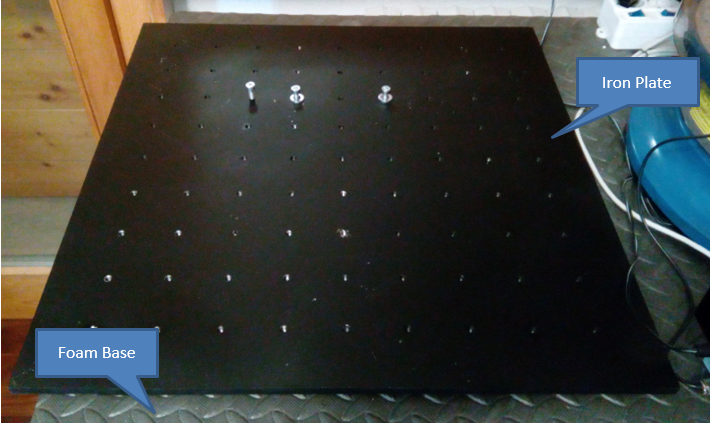 The plate, carefully cleaned and painted black, is then placed on a sturdy and solid table and placed on a foamy plastic material (foam rubber type) so that the vibrations are absorbed : the optical table is ready ! Together with the optical table we have a set of “basic” equipment necessary to complete our “amateur” optical experiences. The main light source is a He-Ne laser with 632nm emission, we then have a series of semiconductor lasers and a series of LEDs of various colors driven by a constant current driver so that the light intensity remains constant over time. 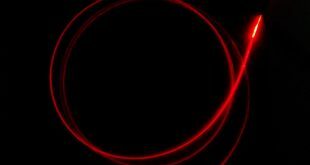 The images below show these light sources. The set of equipment also includes polarizing filters, holders, micrometers and a rotary table obtained from robotics projects. 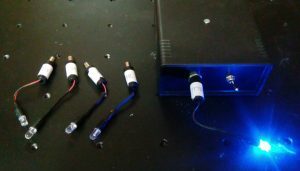 A photometer is then necessary for the measurement of light radiation, this device has already been described in the post : PSoC based Photometer. This photometer is based on a PSoC microcontroller with a trans-impedance amplifier, the sensor is a photodiode. In order to improve the selectivity of the sensor at the wavelength of the radiation emitted by the He-Ne laser there is the possibility of using an interference filter centered at 632nm: in this way the environmental radiation is totally eliminated. Another very useful device, to be used together with a light source and a sensor, is an absorption photometer which is used to measure the light radiation that is absorbed by a liquid solution contained in a test tube : in this way it is possible to quantitatively evaluate the solute content based on a previous calibration. The first experience made on our optical table was the determination of Brewster’s angle for an optical glass surface. 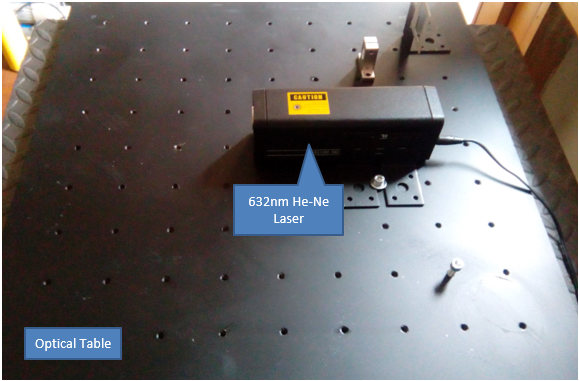 For this experiment you need the He-Ne laser, the polarizing filter, the rotary table with graduated indication and the photometer with the 632nm interference filter. Brewster’s angle (also known as the polarization angle) is an angle of incidence at which light with a particular polarization is perfectly transmitted through a transparent dielectric surface, with no reflection. 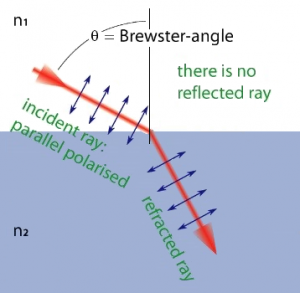 When unpolarized light is incident at this angle, the light that is reflected from the surface is therefore perfectly polarized. This special angle of incidence is named after the Scottish physicist Sir David Brewster (1781–1868). 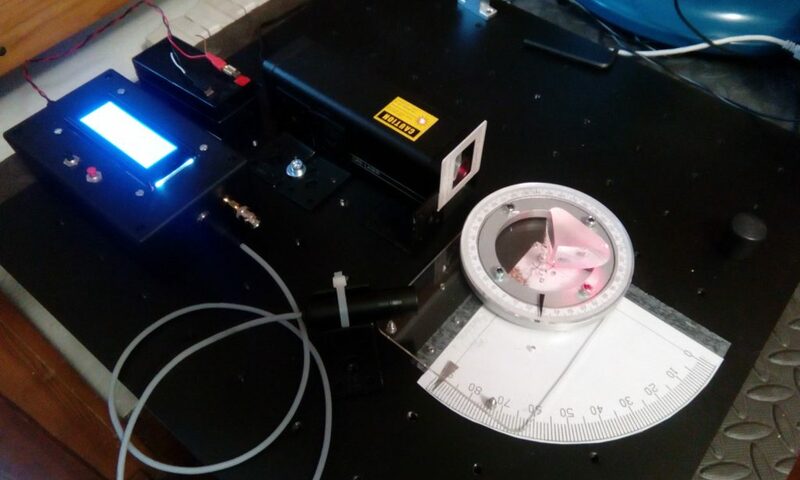 The setup of the experiment is shown in the image below : the laser light is polarized by the polarizing filter, it is reflected by the surface of a glass prism fixed on the rotating table. 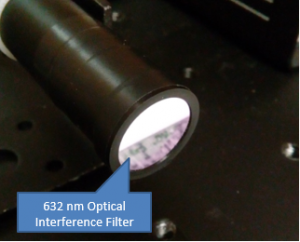 The intensity of the reflected beam is measured by the photometer. Measurements are made according to the angle of reflection. The graph below shows the measurement results. We can see how the intensity of the reflected beam goes to zero at about 55 °, and then rises quickly. 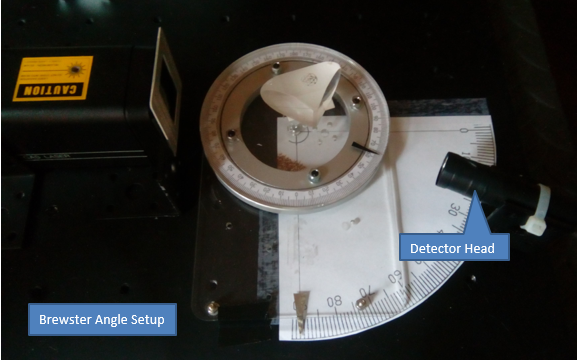 This result, taking into account the geometric positioning tolerances and the uncertainties in the reflection angle reading, is in good agreement with the real data.